American Selfie: Students curate exhibit of century-old selfies with historical African-American photos. Digital tools allow scholars in the humanities to develop innovative means of answering questions and conduct research at a scale previously unimaginable. The Alexander Grass Humanities Institute provides fellowships and other resources for both undergraduate and graduate students. The Alexander Grass Humanities Institute is a focal point for the 10 world-renowned humanities departments at Johns Hopkins, other dynamic departments in the humanistic social sciences, and related centers and programs. The institute sponsors scholarly meetings, public events, visiting scholars, and student fellowships and research projects. A complete calendar of all humanities-related events, including all AGHI-sponsored events, happening at Johns Hopkins is available on our events page. Join us as three academics at different stages of their careers share their unique approaches to queer theory and discuss how they entered into studying the humanities, obstacles they faced, and how they developed their research interests. Free and open to the public; light refreshments will be served. How can we understand and narrativize the recent past when the materials on which those histories depend are elusive? This dilemma is at the core of Rebecca Brown’s new research on the Indian painter K. C. S. Paniker, who combined Western postwar artistic styles with a distinctively Indian sensibility. Many of his works, along with photographs, albums, and personal papers, have been dispersed among family members, collectors, and community stakeholders who struggle to assemble and preserve them. Professor Brown’s talk charts the intimacy and fragility of Paniker’s estate—and suggests what is at stake in modern and contemporary archives more generally. 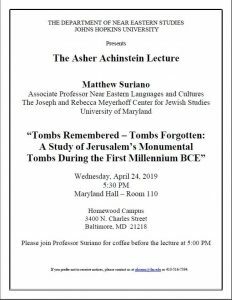 Please join Professor Suriano for coffee before the lecture at 5:00 PM. “Discourse is excited to present the final installment in our “Growing Up in Baltimore” series. Following our adolescence-themed event from March, this final event will focus on the experiences of Baltimoreans who have called this city their home from youth to adulthood. 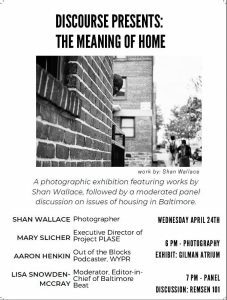 Join us on Wednesday, April 24 from 6pm-7pm in Gilman Atrium and enjoy a photo exhibition showcasing the works of Baltimore-based photographer Shan Wallace. A moderated panel discussion on housing issues in the city will follow from 7pm-8pm in Remsen 101, featuring Shan Wallace, Mary Slicher (Executive Director of Project PLASE), Aaron Henkin (Out of the Blocks Podcaster, WYPR), and Lisa Snowden-McCray (Editor in Chief of Baltimore Beat). Johns Hopkins has a rich history in humanistic studies and is considered the birthplace of modern literary scholarship.